I love to have guests over during the holidays. With that comes the extra cleaning to make it "guest ready". But then the tree leaves all those needles! What to do? Get prepared. 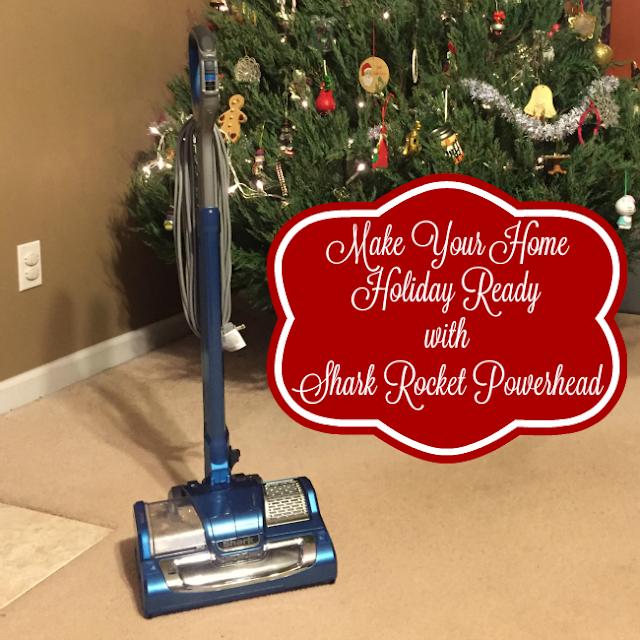 Make your home holiday ready with the Shark Rocket Powerhead. I love the Shark brand and was excited to receive the opportunity to try their new Shark Rocket Powerhead. My daughter loves our new vacuum. Besides the fact that she says, "It's pretty", she actually wants to vacuum with our new Shark Rocket Powerhead. More power to you, girl! ;D Weighing only 9 lbs, not including the cord (only 1 while in motion), now my almost 5 year old daughter can help tackle the vacuuming too. What I love about the Shark Rocket Powerhead is that it has the amazing suction just like my larger Shark Rotator Professional. It has the comfort and ease with maneuverability as well. It has interchangeable brushrolls that are easy to assemble and clean through innovative roller garage. You can clean carpets, rugs, and hard floor surfaces with the Carpet & Floor Brush and Gentle Touch Hard Floor Brushroll and the Fingertip Controls make for easy transitions. It has multi-position adjustable heights tailored to personal preference and compact storage, which means you can get under the coffee table or a bed with ease. Through breakthrough engineering combines motor and dust cup in the head of the vacuum, reducing airflow path and maximizing efficiency and power, which means no heavy canister to empty. The Shark Rocket Powerhead is available for purchase at all major retailers nationwide for around $169, including Amazon.com. I have included it in my Holiday Gift Guide because if anyone has a Shark on their list, then this is the one to get them. How do you make your home holiday ready? What do you think of the Shark Rocket Powerhead?